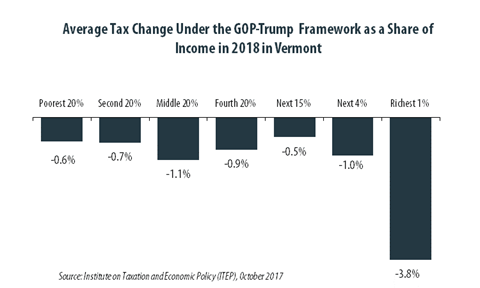 The “tax reform framework” released by the Trump administration and congressional Republican leaders on September 27 would not benefit everyone in Vermont equally. The richest one percent of Vermont residents would receive 45.1 percent of the tax cuts within the state under the framework in 2018. These households are projected to have an income of at least $505,400 next year. The framework would provide them an average tax cut of $45,250 in 2018, which would increase their income by an average of 3.8 percent. The framework would particularly benefit those with incomes greater than $1 million. These households will make up just 0.3 percent of Vermont’s population but would receive 31.7 percent of the tax cuts if the plan was in effect next year. This group would receive an average tax cut of $97,100 in 2018 alone, which would increase their income by an average of 4.3 percent. The middle fifth of households in Vermont, people who are literally the state’s “middle-class” would not fare as well. 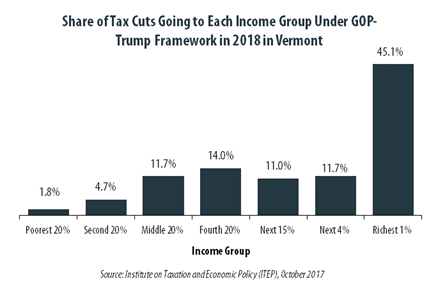 Despite being 20 percent of the population, this group would receive just 11.7 percent of the tax cuts that go to Vermont under the framework. In 2018 this group is projected to earn between $44,200 and $66,000. The framework would cut their taxes by an average of $600, which would increase their income by an average of 1.1 percent. If the framework was in effect in 2018, 9.5 percent of of Vermont households would face a tax hike. Whether a family would pay higher or lower taxes would depend on their circumstances. There are two provisions that reduce the amount of income that is subject to taxes for most families, and the framework increases one of them (the standard deduction) while repealing the other (the personal exemption). Families who itemize their deductions (rather than claming the standard deduction) may pay higher taxes beause the framework repeals most itemized deductions, including the deduction for state and local taxes. The framework would be particularly generous to the wealthy in large part because it would reduce the corporate income tax rate. The bulk of the benefits would go to the owners of corporate stocks and other business assets, a group of overwhelmingly (although not entirely) high-income taxpayers. The framework would also provide a special tax rate of 25 percent for other types of businesses. While it describes this as a tax cut for “small businesses,” most of the benefits would go to the richest one percent of Americans. The wealthiest taxpayers would also benefit greatly from the framework’s reduction in the top personal income tax rate from 39.6 percent to 35 percent and elimination of the estate tax. These figures have been calculated by the Institute on Taxation and Economic Policy (ITEP). Because the framework leaves many unanswered questions, this analysis required several assumptions that are explained in ITEP’s longer report. ITEP generally interprets vague proposals in the framework to match more detailed ones that were included in Donald Trump’s presidential campaign or in tax overhaul proposals from Republican leaders in Congress. The table below provides more detail about the effects of the administration’s tax proposals on households at different income levels. The tax proposals included in these figures are the following, which are described in more detail in ITEP’s longer report. Repeal personal exemptions and increase the standard deduction. Replace current income tax brackets with three brackets, 12 percent, 25 percent, and 35 percent. Increase non-refundable child tax credit and new non-refundable credit for other dependents. Eliminate all itemized deductions except those for charitable giving and home mortgage interest. Special tax rate (25 percent) for businesses that do not pay the corporate income tax. Repeal special tax breaks for businesses and reduce the corporate tax rate from 35 percent to 20 percent. Allow businesses to write off full costs of investment in the first year.